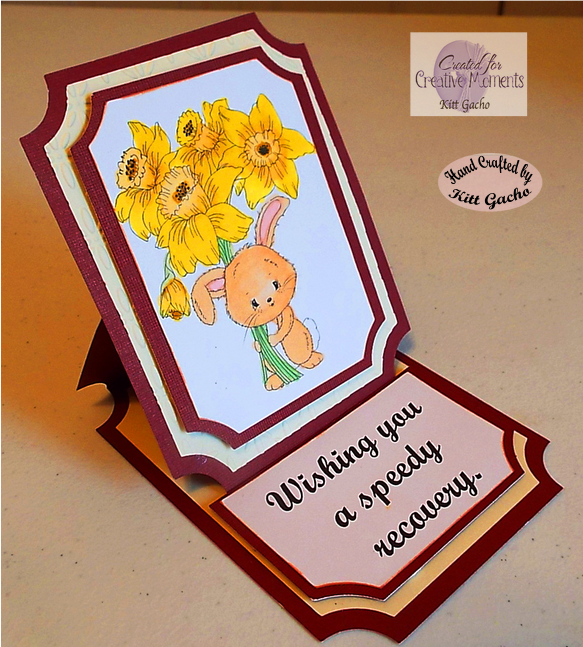 Here is my easel card for a dear friend who had knee surgery a few days ago and she will be going for the other knee surgery in 3 weeks. This adorable image is from Di's Digi stamps I used spectrum noir markers to color it. I embossed the layer with the cuttlebug baby breath embossing folder. For depth I mounted the image and the sentiment on pop dots. The challenge over at Creative Moments is to create a tag or card for a special lady or mom. I lost my mom over a year ago. So I made this for my friend. Make sure you stop by and see what the talented DT has for your mother's day card/tag inspiration. Follow me along for another 3D project coming soon. Thanks for leaving your comments I look forward to reading them. Have a happy crafty day.